This article is the fourth in a four-part series that addresses the new tax law and some of the impact it will have on companies that purchase heavy equipment and are looking for equipment financing. This was an interview conducted by Mark Lempko and Don Pokorny, both of CCG, with Dixon Hughes Goodman LLP (DHG). The information conveyed herein is meant to be informative and should not be construed as specific tax advice. CCG: This is another area that we are hearing fact fiction with net operating loss (NOL) and alternative minimum tax (AMT). Can you offer any discussion relative to the changes in rules regarding the recognition of NOLs going forward? Nathan (DHG): Yes, there are. 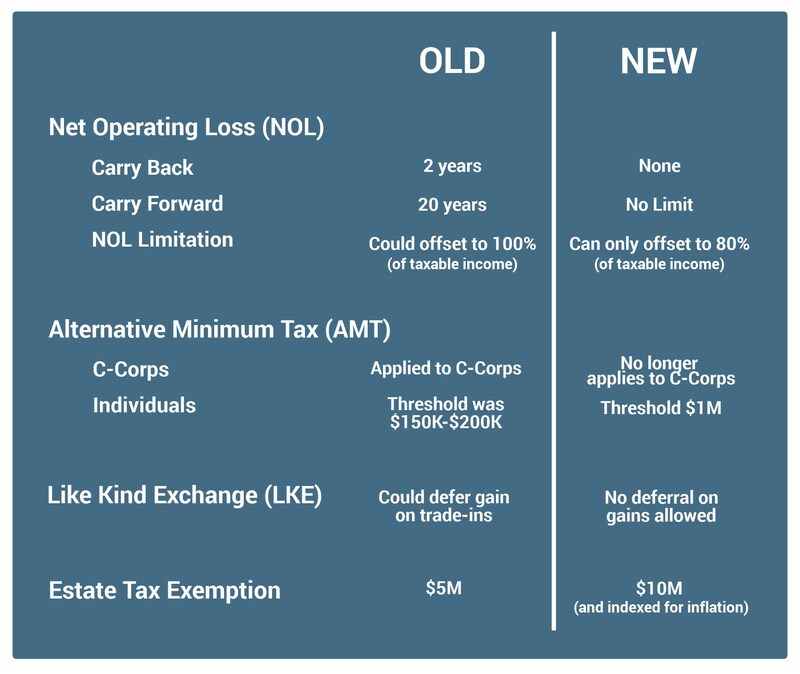 For NOLs under the old law, if you had a tax loss for the year (an NOL), you could carry it back 2 years to apply against taxable income from the prior 2 years to claim a refund. Or, you could carry it forward 20 years to offset taxable income in future years. They changed those rules so that now there is no carryback, only carryforward. And there is no limit to how long you can carryforward. Your NOLs will carryforward indefinitely. But, there is another big change from the old rules. Say you had a loss this year, and it fully offset your taxable income for the next year, plus you had some more loss that you carry that to the future. That piece changed. Now, you can only offset up to 80% of a year's taxable income. So, you could have big NOLs that are carrying over and have capacity to offset your entire taxable income, but you'll be limited in the amount of NOLs that you can apply to taxable income. And, you will still have to pay some tax on that remaining 20%. CCG: I want to make sure I am understanding this correctly. If at the end of a year you have after-tax income of $100 thousand, even if you have an NOL that's 200 thousand, you can only use 80% of it against the 100 thousand, subsequently resulting in a $20 thousand tax bill? Nathan (DHG): Almost. The result in that example is $20,000 of taxable income. CCG: But, as you noted, they are then able to carry that NOL forward, and there isn't a time limit that for future tax income to be offset? DHG: Correct, there is no longer a time limit. There is also no longer an AMT alternative minimum tax for C Corporations. That was eliminated. But the AMT tax continues to exist for individuals. If your clients are arranged as pass-throughs, they will still potentially be subject to AMT as individuals. However, the threshold (the amount where AMT starts to kick in) was increased significantly. It really started to kick in around $150-200 thousand in taxable income at an individual level, and now that's been pushed up to $1 million. CCG: So, it is there on a much smaller pool that it will impact. We had this other question on whether loss carries forward or carries backward if 179 or bonus depreciation exceeds income. We touched on that if I'm not mistaken. Nathan (DHG): 179 doesn't create losses. Nathan (DHG): Yes, bonus depreciation can create losses though and they will carryforward. CCG: We, as an organization, don't do a lot of tax leasing with our customer base. I don't know if you are involved in that at all, but are there proposed changes to the treatment of tax leases under the new act? What I mean by that is in the past a true tax lease would allow a tax payer to deduct the entire amount of the rent they were paying on a monthly basis, in lieu of interest and depreciation deduction. Are changes to that treatment in the new bill? DHG: There were no changes to how a transaction is characterized, whether it is treated as a lease or sale. There were no changes there. CCG: Please discuss the changes in the estate taxes and would they impact C Corp over pass-through entities differently. DHG: The estate tax exemption, so the amount at which your estate becomes subject to the estate tax, was $5 million. If your estate was less than that, you did not pay the estate tax. That has been pushed up to $10 million and indexed for inflation, therefore, estates worth $10 million and less are not subject to the estate tax. How that interplays with C Corps and entities...it just depends on what is the asset in the estate of the individual that passed away. CCG: Let's move to this next question regarding the impact of the like kind exchange (LKE) 1031. I have a customer in this situation actually. Can you comment on what LKE offered in the past and what this will mean to our customers moving forward? DHG: In the past, considering LKEs, if you exchanged or traded a piece of equipment for a new piece and you received value for the old asset, so let's say the trade-in value was greater than the adjusted basis of the asset, which is basically cost less all the depreciation you claimed, you would have a gain for tax purposes, and the LKE would allow you to defer paying tax on that gain as long as you rolled your basis over into a new asset. So, you were able to defer a gain on these asset trades as long as you continued to trade. The new rule says that you can no longer do LKE on personal property, equipment type assets. LKE now only applies to real property, buildings and the like under the new law. Now you don't have that gain deferral on trade-in. Let's say your customer buys an ambulance for $300,000, claims the full expensing of it so now it’s adjusted basis is zero. They trade that in 5 years from now and get a credit of $100 thousand. That’s going to be a tax gain of $100 thousand that they'd have to pay taxes on. CCG: They won't be able to defer or flip basis into another asset? CCG: I can't tell you how impactful that will be on our customers. For example, in the crane industry there are assets that cost $2-3-4 million that a number of entities have been using as LKEs for some time now. And they are finding that the tax bill coming this year will pose some difficulty. DHG: It's going to bite industries especially hard where the equipment maintains a long useful life and a value for a long period of time. I've seen it a good bit in the construction industry too. CCG: Yeah, that's where we are seeing it. Nathan (DHG): Heavy equipment just lasts a while, and you might have it fully depreciated in 5 years. So, say in 7 years you trade it, it still has value. David (DHG): I think about it as well as it's also a facts and circumstances around the property, sales proceeds, and value of what you are buying as a replacement. And I hate to use the word, math gain, but it's a math gain and the LKE is relatively the same as recognizing the gain with a full 100% bonus depreciation deduction. I know it's very specific to each deal, but it could be not as impactful as one could believe because of the juice or extra added bonus from 100% depreciation realm. CCG: Given the conversation, and because I was unaware of the aggregate taxable receipt issue, we were so concerned about our customers $5-6 million in revenue that they will go out and buy a $2 million crane, trade in the 6-year-old one for $800 thousand, and they are levering the transaction. At first you got a capital gain; the asset was fully depreciated so there is an $800 thousand capital gain. Then they could write off the 2 million on the 100%, but then we were worried on the interest deduction. There are so many issues that companies are going to have to model. But I'm glad to hear that the threshold is under 25 million; it won't be as impactful to our customers as I thought it would be. In your experience to date, is there any practical ways to address this LKE change for companies that are already in this position now, facing the gun barrel of a tax event? DHG: Part of the thinking is that companies will be able to claim the bonus expensing, creating huge deductions for the loss to offset some of the gains. It might depend on character of the gains, but for at least a period of time you are going to have very large bonus depreciation deductions to offset those gains. The downside, mentioned before, bonus is going to sunset and go away at some point, so you're going to be left with no bonus depreciation and will no longer have LKE. You're only going to have these bonus depreciation deductions for a period of time. CCG: Any changes relative to the evaluation for basis for partners and LLCs in this new tax law. DHG: There was one change that relates to the basis from the interest deductions. If your interest deduction is limited, so remember we talked before about the 30% of EBITDA, if you're a partnership and you have excess interest that you can't deduct, that interest pass-through the partnership and is carried over but passes through to the individual and the individual will maintain that carryforward. But when it passes through to that partner, their basis in the partnership is reduced by the amount of that interest that they weren't allowed to deduct. That can be a problem if they don't have basis in the future, if distributions are made from the partnership to the partner and they do not have basis then those distributions may be taxable. There may be other implications when they sell the business not having basis, meaning there's a capital gain. Those deductions when you sell the partnership, those basis deductions are added back so then you may get benefit of having basis at the sale, so now you're not paying ordinary income because of the interest that was reflected in the basis. CCG: Any other last comments? Nathan (DHG): Yeah, I think it's important to emphasize that not all of this stuff is permanent. Most of the things that affect individuals will sunset and revert to the old rules. The pass-through deduction will expire, all the changes to itemized deductions, the increase to AMT thresholds will go away, the increase to estate tax will drop back down around 2025. In addition, bonus depreciation will start to sunset and will be fully gone at the end of 2026. David (DHG): Great point. A lot of people are not focusing on the fact that corporations got the permanent side, and the individuals will be faced with trying to reconcile that in years to come. Nathan (DHG): The tax hike in 2026 is going to be ugly on individuals. CCG: Does that return to the ladder structure that we have now? It will revert back to the effective rates of 2017 with the loss of some of these deductions that we have been discussing for the last hour? DHG: Correct. If you have any clients that operate outside of the United States, there are a whole bunch of new rules that they will have to pay attention to. CCG: We are domestic US and Canada. We do have some entities that have pass-throughs in Canada and US but they are limited. Concerning the tax hike in 2026 being ugly, let's be honest, what's the likelihood that there won't be further changes to any of this. Just like the Section 179, it was supposedly phasing out and now that has changed. Right now, it sounds horrible, but we don't know that it won't change. DHG: That's a fair point but we do have some precedent because the last major tax change was referred to as the Bush Tax Cuts which lasted for a period of ten years and when all of those sunset, it had the same effect of a huge tax increase on individuals and businesses. For period for the next five years, we had a discussion at the end of each year about extenders. Extending AMT fixes, R&D tax credit, etc. What that created was, they didn't want all these expirations to happen, so they kept extending them for one or two years. CCG: Yes, but many times did we see the modifications to Bonus depreciation and 179 over the past however many years? DHG: Fair point, they will probably try to combat that with some sort of extenders.